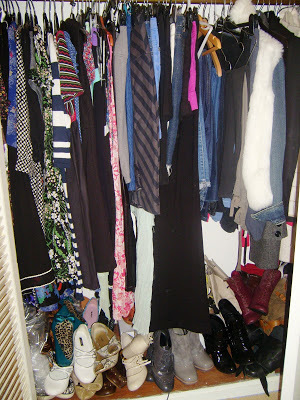 3) I’m secretly hoping a ‘what does your wardrobe look like?’ feature will catch on to all you other fashion bloggers…come on girls…..
Now I know it’s a bit of mess and it’s starting to overflow but I kinda like it like that…how do you keep yours??? All that colour! It looks like there are some gems in there. I’d love to have a rummage ha ha. You think that’s a mess? Haha…I hate even opening the door to mine, stuff always falls out on me. Hello's…oh jeez your wardrobe looks a fun! My wardrobe is the back of my chair, and my bags are hooked around my bedroom door ha ha…I never really bother with a wardrobe ha ha!! so colorful! Love it 🙂 looks you like have some really fabulous bags!!! Girl you have A LOT of clothes!! 🙂 I just recently organized mine according to colours. I do that every couple months.. Wear You Been, Wear You At & Wear You Going? I’d really like to have a rummage in there myself! I love finding things I haven’t worn in ages or forgotten- it feels like I just bought myself something new for free! Wow you have sooo many clothes I love your closet haha. Mine’s…. a lot worse. probably.